A hot summer is coming and it is time for a refined cup of cold brewed coffee. We all know how uncomfortable some summer days can be, so cold brewed coffee is an important tool for survival. Close your eyes for a minute and imagine a sweet rich flavour of ice-cold coffee served to you on a very hot day, with maybe a warm cinnamon scone. This simple but intelligent and refreshing caffeine cold brew is absolutely unlike any cup of coffee you will ever taste. Watch out for iced coffee waiting in the cafés, trying to claim that it is the same drink. 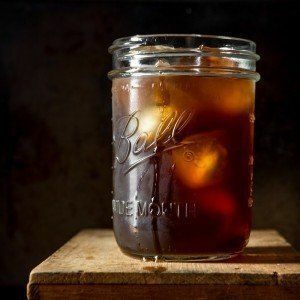 Take a look at this video from Jamie Oliver’s Drinks Tube showing how to make cold brew coffee at home and you’ll soon see the difference between this so-called “iced coffee” we see being served up at cafés and real cold brew coffee. What’s The Difference Between Iced Coffee & Cold Brew Coffee? If you took a few minutes to watch that video, iced coffee is not the same as cold-brewed coffee. Iced coffee is brewed coffee that is hot and poured over ice. Cold-brewed coffee is ground coffee steeped in cold water and then strained before serving. The difference in flavour between the two is startling! If you’re at the coffee shop, watch for “cold brew” coffee that is actually just coffee on ice. Sorry, not the same thing. The thing is, it can be hard to see the difference at a glance, because both iced coffee and cold brew coffee looks like coffee, and both can be on ice. If there’s any doubt, just ask your barista if its “real” cold brew, and if they hiss at you like a vampire presented with a crucifix, then you can bet they’re trying to pass off iced coffee as cold brew. Not that there’s anything particularly wrong with iced coffee, but it’s certainly not like cold brew. For example, iced coffee doesn’t take that long to prepare. Just brew yourself a hot cup of coffee and then pour it over some ice. There. Done. You will soon discover that you might have to brew some extra strong coffee, because you will be diluting it when you pour it over the ice. The taste will be rather bitter because the hot water will extract the flavours from the beans. Coffee shops often mask any inconsistencies in the taste by adding a whole bunch of sugar, cream, and anything else that might make it taste better. 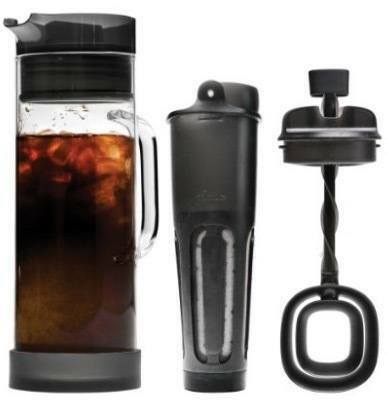 The cold brewed coffee method takes up to 24 hours to prepare. The slow infusion of the flavour from the ground beans into the cold water for almost a day, makes the drink less acidic, and much sweeter tasting. If you want to serve this cold drink with ice, go ahead. The cold brewed coffee is already cold, so you won’t lose any flavours that get lost when making regular hot coffee. To recap what we just saw in the video, Derek’s cold brew recipe has a prep time of about 10 minutes, while the actual brewing can take up to 14 hours! In regards to the jar, this is simply to store your cold brew so maybe you want something bigger than a gallon, or maybe smaller. It depends where you’ll be storing it, but the size of the container is completely up to you! Manual burr grinders are a lot cheaper than an electric burr grinder, which will still do the job, and much more consistent than a blade grinder. Overall, you want your coffee grinds to be fresh so getting yourself a good coffee grinder is definitely worth looking in to! These bags are extremely handy when it comes to making cold brew, as it makes the process less messy and faster clean-up, although they aren’t totally necessary. You could just as easily use something like cheese cloth to do the same job. Of all the ingredients involved in making cold brew coffee, this one has the most leeway, because it all depends on what type of coffee flavor you’re after. However, as long as you’re grinding fresh with your burr grinder, you’ll always get the best results. Also, you may need more than one bag depending on how much you make. A handy tool for weighing out your coffee beans if you plan on making cold brew in bulk. Remember, this is probably going to be an all-nighter when it comes to making your cold brew in the finest possible fashion. Don’t get antsy and take it out early. It needs to go through the full process for maximum flavour extraction. 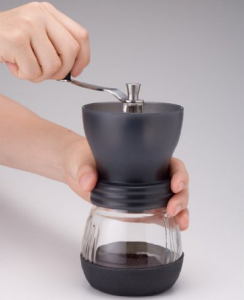 Making cold brewed coffee is really simple. The most difficult part to this is finding the cold filtered water and the fresh ground beans. Don’t grind them too fine. There are even companies like “Toddy” who have developed their own equipment for brewing this cold coffee drink. 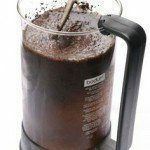 • Grind up your favorite beans maybe using the 4 parts water to 1 part coffee ratio. Even more coffee is better. Keep in mind that the fusion is longer than if you were using heat. 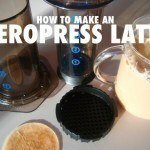 • Add the grinds to your French press. 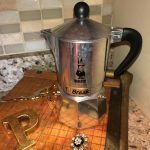 • Saturate the coffee grinds with your cold filtered water by stirring well. • Put the plunger aside for later but cover the cold coffee and place in the fridge for at least 12 hours and up to 24 hours. • Plunge the coffee and you are ready to serve. Chose a fancy glass with some crushed ice or fat cubes. A small coloured straw for dainty sips might be fun. Make warm scones and invite a friend over for a treat. Mix the water with the ground coffee in a large glass bowl. Pour it into mason jars. Every second hand store has these for less than a dollar. Place them in the fridge for a day before you start drinking them. Filter the mixture using an old t-shirt or maybe a nylon stocking – whatever you have around the house. That’s it! You could create your own “frap” by adding a dollop of your favorite ice cream. Your guests will love you. It will be less acidic and seem sweeter. Since the cold water takes longer to extract the caffeine from the beans, the magic of time will leave the bitter compounds in the beans and only extract the best flavours. Since there is no heat involved, the chemical compounds in the coffee will be untouched. The cold brew if kept covered while in the fridge, will keep for about 2 weeks and still taste the same, again because no heat was used. You will begin to taste the difference in the blends.